brackets. Building fasteners not included. abrasion resistant 22 oz. 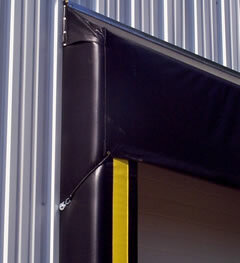 vinyl coated nylon fabric is used to cover our standard seals. compression of the seal, reducing the amount of stress on the vinyl fabric. 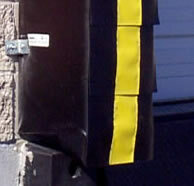 Grommets in bottom panels allow drainage of moisture. 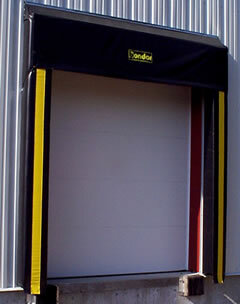 recommended design for 8" wide doors. (See sketch). If there is no existing bumper or setback dimension, select the 10" projection. 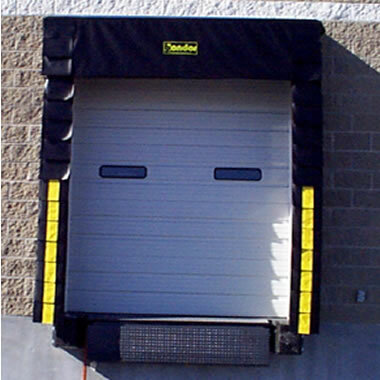 a T-1DHD Heavy Duty Drape Dock Seal with a 10" projection with beveled side pads 12" wide at face and 8"
wide at back with standard vertical side pads for a door opening of 8' W x 10' H.
4. Add desired special options from below - wear pleats, curtain and wide face header pads. 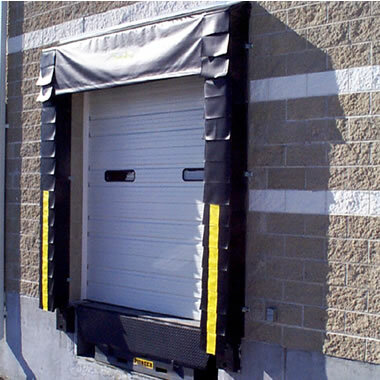 Optional Wear Pleat Surface - 4"
Providence, RI, to fit a door opening of 8' wide x 12' high. galvanized pipe sewn into curtain. Curtain to be provided with elastic shock cords to hold curtain in place.